This stunning star pendant is expertly crafted in rhodium treated 925 sterling silver features six Created emeralds in the center and five pointed star accented with round white CZs in pave setting. It has a total gem weight TGW of 1.00 carat and comes with standard 16 inches silver chain. 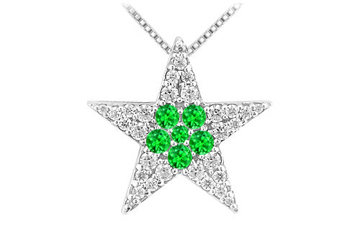 This star design pendant is always popular and fashionable.